Located right off of Route 28 in Bridgwater, NJ, Fairway 28 is located in a beautiful location! Award-winning universities, beautiful parks and trails, and great restaurants and nightlife scene - this desirable community is where you want to be. Bridgewater, NJ is a diverse and thriving municipality just an hour away from New York City. Learn more about local restaurants, community events, and other points of interest in this sought-after place to live. Bridgewater, NJ is host to a long list of recreational activities including award winning golf courses, health clubs and gyms, and beautiful trails. Find out more about the variety of ways Bridgewater locals get out and stay active. Get out and have some fun at these local restaurants and nightlife venues. Whether you are looking for some great food, or a place to get a few drinks with friends, these local favorites are some of the best places to visit in Bridgewater, NJ. Bridgewater is just minutes away from a mix of community colleges and prestigious ivy league schools. If you are looking to start you college career, or just looking to build your resume, you are sure to find the right school nearby. If you are in need of quality medical care, you will be glad to know that Bridgewater is home to some of the best hospitals in the nation. The hospitals nearby are well-known for their medical and industry expertise and quality care. Planning a fun day trip with friends or family? Need ideas for a mini vacation for the weekend? These fun day trips are perfect for family or friends and are sure to create lasting memories. Learn more about day trips near Bridgewater! The township of Bridgewater provides plenty of options for those looking for regional transportation. Everything from train to bus, we have listed out the best ways to get around. Stay connected and informed with these great transportation options. Bridgewater is home to both small, local boutique stores and large, sprawling shopping centers. Learn more about the various shopping options in town including the one of New Jersey's most well known shopping malls. Bridgewater has unique and fun entertaiment opportunites for the whole family. Whether you are a fan of theatre, or you would rather chow down on a hotdog at a local baseball game, Bridgewater has many activities to enjoy year round. 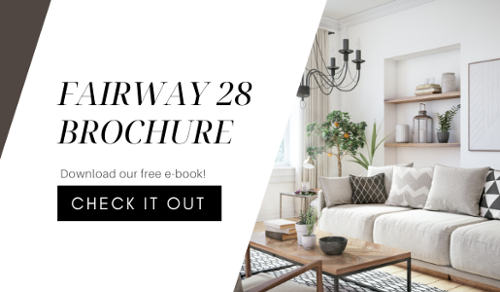 Fairway 28 apartments have so much to offer for any new resident. Discover the amenities that set renting apart from buying in this Rental Community, from a fitness center to the security of property management and maintenance. Discover the community favorites when it comes to worship in Bridgewater, NJ. No matter your religion, Bridgewater has a community and a place of worship for you. If your pet is a furry family member, then Bridgewater is an excellent city for you! Filled with pet stores, pet friendly restaurants, and other animal lover amenities, Bridgewater loves pets! New England is one of the most scenic parts of the country. With coastal sunsets, woods filled with changing leaves, and so much more, discover the world-famous road trips and scenic lookouts near Bridgewater NJ. Moving to Bridgewater? New to the area? Sometimes a great Happy Hour is the best way to befriend coworkers and to meet new people! Entertain yourself and your friends with these local favorites. Get out and have some fun at these local nightlife venues. Whether you are looking for some late night bites, or a place to get a few drinks after work with friends, these local favorites are some of the best places to visit in Bridgewater, NJ. Moving means finding new amenities. This includes finding a new gym. No matter if you're looking for a yoga studio, a crossfit gym, or a large fitness center, there are plenty of options in Bridgewater! Are you a fan of hiking? No matter if you're looking for new sights, a fun way to see the fall foliage, or more opportunities to get out and about in the fresh New Jersey air, Bridgewater is filled with trails!